Size, type and condition are all important when making sure the right needle is selected for the job. The importance of sewing needles in the stitching operation is often underestimated. Although their unit cost is low, they are highly engineered items and the type, size and quality of the needle used will significantly affect the appearance and performance of the final seam. Seam construction involves many elements, all of which are critical to correct functioning of the seam in service. These elements include the stitching machine, the material being sewn, the size and type of thread and the size and type of needle. Stitching machines must of course be regularly maintained and settings adjusted each time they are used for different types of work. The materials being sewn must be of the correct specifications for the product. Threads must be of the correct size and type for the product and used at the optimum stitch density. This article covers the fourth of these elements: a small easily replacable component, the needle. The main parts of a sewing machine needle are shown in figure 1. The centre section, known as the blade, is the factor determining the metric size classification of the needle. This is measured in hundredths of a millimetre. For example, if the diameter of the blade is 0.9mm, the size will be 90 (because 0.9mm is 90 hundredths of a millimetre). 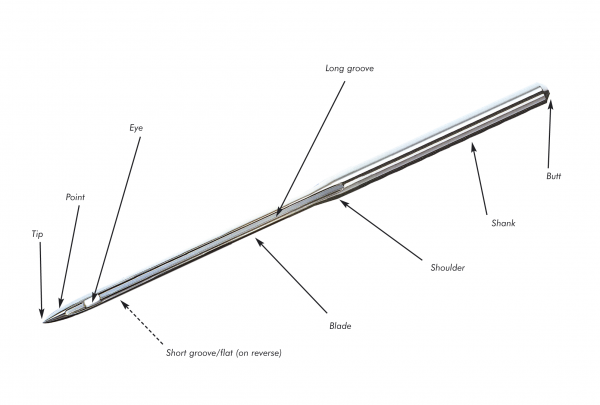 There are many different needle ‘systems’ designed to fit different brands of sewing machines and these are usually characterised by the shank length and diameter. However, within each system there are many other design variations which can affect the length of the blade and the contours in the eye regions: these variations are intended to enhance stitching performance with different materials or to address particular sewing problems. It is estimated that there are currently up to 6,000 different needle variations available! Firstly, the size of the needle must be chosen to match the size of the thread being used. Never match thread to needle. The thread must be chosen first to suit the seam under construction. Too small a needle for the thread size may cause the thread to snarl and break whilst one which is too large may result in skipped stitches and produce unsightly seams. The recommended needle sizes for various thread sizes are shown in box 1. It is worth emphasising here that needle sizes increase the larger (thicker) they are, so a size 120 needle is larger than a size 90 needle. However, the most common thread sizing system (metric ticket number) is based on the length per unit weight (metres per kilogram) so the larger the number the smaller (thinner) is the thread. Secondly, the needle type must be considered. This is concerned with the point and tip of the needle and there are two main groups: the cutting points such as narrow wedge, triangular and spear, and the puncturing (or cloth) points such as round and Tri-R (the latter is a round point with a triangular tip). Textiles and coated fabric materials are usually best sewn with cloth points as these will separate and push between the textile yarns without damaging them and weakening the fabric. Leathers are more dense materials and are nearly always best sewn with cutting point needles (for example, narrow wedge types). Where mixed leather or textile work is being sewn, narrow wedge needles are recommended but round point types can be used in some circumstances. Thirdly, the condition of every needle must be checked, certainly at the start of each shift and again frequently throughout the working day. Clearly, damaged needles must be replaced. New needles should be rolled on a flat surface to check they are not bent. Needle wear is less easy to notice yet some heavy duty materials such as denim will blunt needles quite rapidly which can lead to thread damage. Needles should therefore be routinely changed (at least after every work break, if not sooner) even though the needle may appear to be undamaged. It is also recommended that factories have a formal ‘needle policy’ whereby all sewing needles are ‘booked out’ to the operatives and all these must be accounted for when finishing work. Not only does this ensure that the correct needles are being used for each batch of work but also that all pieces of any broken needles are collected and returned to the supervisor. This ensures that no pieces of needle are ‘lost’ in the stitched product which could lead to injury to a subsequent user: this could lead to an expensive compensation claim. Sewing needles are highly engineered precision instruments and this should be reflected in the attention given to their selection. 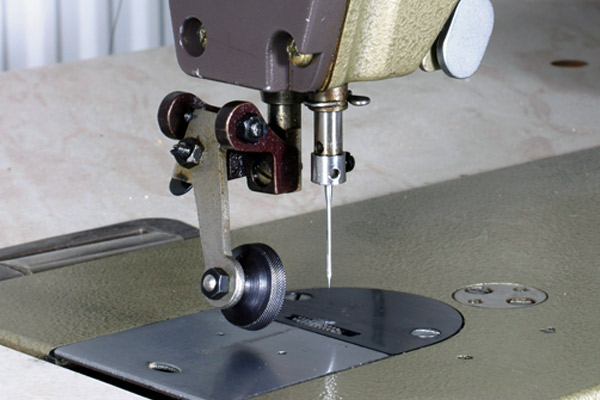 The needle’s size and type must match the machine, the thread and the material being sewn. Their use should be carefully controlled to ensure seams not only look attractive in the furniture, clothing or whatever the finished product may be, but also perform well during service. The issuing of needles to operatives should also be subjected to rigorous controls to ensure no broken needle parts are left in sewn products. SATRA can advise on all aspects of needles. Please email footwear@satra.com for more information.